A-101-6 is a new filter module that uses so-called opto FETs to control the filter frequency. Opto FETs are very similar to Vactrols but use light depending field effect transistors (FETs) instead of light depending resistors (LDRs). A opto FET is a combination of a light depending FET and a LED (light emitting diode) both put into a small light-proof case. The advantage compared to vactrols is the much faster response of opto FETs compared to LDRs. This allows much faster attack/decay times and even FM effects. 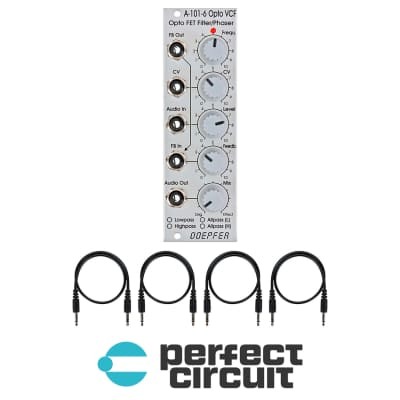 The disadvantage compared to vactrols is that the FET behaves as a normal Ohm resistor only for small levels. With higher levels the FET begins to distort. 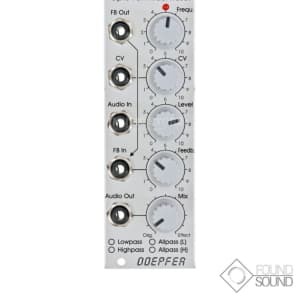 Module A-101-6 is made of six serial 6dB filter stages. 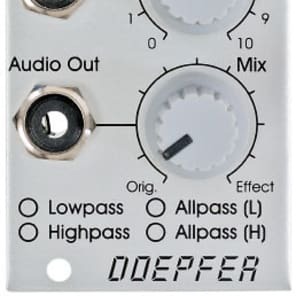 Each stage can work as lowpass, highpass or one of two allpass types. The variable resistors shown in the schematics corresponds to the opto FET. The brightness of the Opto FET LEDs and consequently the filter frequency can be adjusted manually (Frequ. control) and controlled by means of an external control voltage (CV) with attenuator. The LED at the front panel reflects the LED brightness inside the opto FETs. The resonance is controlled by the Feedback control up to self oscillation. By means of a trimming potentiometer the maximal feedback can be adjusted. High feedback values can be used mainly in the allpass mode to obtain very extreme self oscillation sounds. Even an external feedback signal can be used instead of the internal feedback connection (FB In socket). The Mix control is used to pan between the original signal (CCW position) and the effect signal (CW position). In filter mode (LP/HP) this control is usually set fully CW. In the allpass modes one obtains phasing sounds at center position or "pure" allpass sound in fully CW position.